I had to deal with a difficult dilemma a couple of weeks ago: either being present to my friend Samad’s burial (he has been stabbed to death for his smartphone!) 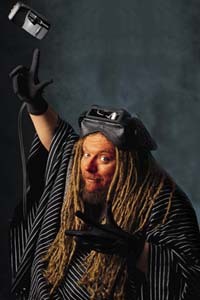 or meeting Jaron Lanier, one of the fathers of Virtual Reality (he actually coined the term “Virtual Reality”). Samad was all about giving the opportunity to young people to have access to new technologies. I am sure he would have approved my choice of going to Jaron Lanier’s inspirational talk. Although my heart was with Samad. The talk was organised by Mel Salter, another VR pioneer, at UCL. My colleagues from the VR field at Goldsmiths were all there as well as many other scientists using VR in their research. The main incentive to organise the talk was to promote Jaron Lanier’s new book “Dawn of the New Everything: Encounters with Reality and Virtual Reality”. Jaron went on with the talk following his book structure to present his thoughts about the potential of VR with a thesis, an antithesis and a synthesis. As Marco Gillies has written a thorough post on this, I will only give you a brief description. From his childhood to an idealist young man, Jaron had always thought that natural language felt like a “beta version of communication”. What he saw in VR was an infinite game setup for a “post-Symbolic Communication”. He founded one of the first VR company called VPL in 1980s and made one of the first VR system consisting of a head-mounted display and datagloves. One the one hand, VR is the most natural medium ever created, (all the arts can be done in VR) on the other hand, it has the means of controlling our behaviours. On the difference between education and mind control. – education is an infinite game so that you can adapt what you learn to your own goal, not someone else’s. VR and AR will actually make us more aware of reality, looking at it from a new perspective. What an inspiring talk by such an influencer of the Metaverse! Will WebVR bring us the Metaverse? The last couple of years have brought us a lot of amazing promises about the future of VR! However, are they really looking at what is important? How VR will improve people lives, how can it enhance the way we are communicating and getting access to information? 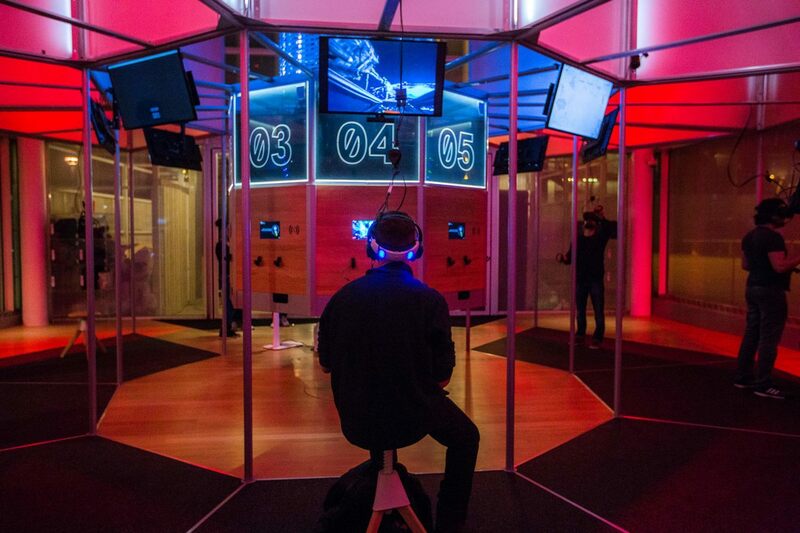 How will VR help us making sense of the overwhelming amount of data produced today? To reach the mass market, the “useful argument” is fundamental. The first mobile phone (Motorola, 1973) was a gigantic device we could barely carry around, however, it served a purpose that would reach millions of people, it improved vastly the way people communicate. Galaxy Game (1971), first coin-operated game. New technologies never started with some shiny and all perfect experiences. The first widely available video game (1971), “Galaxy Game” was displaying just a bunch of squares on a screen. Though the gameplay was fun. Same thing with Minecraft, it doesn’t have to be hyper realistic to bring millions of people building beautiful art pieces with cubes. Of course, games don’t seem to be useful, although there are fundamental in the way humans learn and communicate with each other. My take on this matter is that to have a mass adoption of VR, it has to propose the next huge leap to improve communication. For that, it has to happen online, accessible freely to anyone independently of hardware and software. WebVR seems to be the perfect fit for such a revolution. This idea is nothing new. Jaron Lanier (next post on his recent London talk) was dreaming about this in the 70s when he coined the words “Virtual Reality”. Then William Gibson came up with the “Cyberspace” term in his fiction “Neuromancer” (1984). Today, some are using the term “Metaverse”, thanks to Niel Stephenson’s novel, “Snow Crash” (1992). The main idea is to propose an interconnected persistent computer generated online world within which anyone could potentially access any data and render them in a meaningful manner to him (and everybody else). In other words, an open source webVR has just that potential: the ability to grab all sort of information from anywhere on the internet and pull it in a VR experience without any system boundaries. Looking forward to an open webVR for the future of education. Celebration time, progress has been made, on 3rd October 2017, I passed my upgrade. It took me a while to get there. It took me actually more than 540 hours of mostly writing to be awarded a MPhil (Master of philosophy). I can now work towards obtaining a PhD (Doctor of philosophy). Follows an extract of this upgrade report to browse a better picture of what I am working on. This is the introduction. We live in exciting times where technologies developed for the last 50 years are converging. Mobile computers, with the smartphone being the catalyst of those technologies, are spreading into the market faster than any other technology before, reaching almost saturation in western countries. Today, most high end smartphones offers the possibility of basic level of immersion in Virtual Reality. This brings a completely different medium of communication and interaction with our digital environment. We are on the verge of breaking through the frame, the screen, the window… By coming back to a more natural interaction with the digital realm, we have the opportunity to rediscover one of the great humans strength: spatial awarness. Virtual Reality has been used as a laboratory test environment across many different fields for the last five decades. Cognitive processes such as visuospatial perception, memory, spatial awareness, navigation, are just a few areas of investigation that have been placed under the lens of different types of Virtual Reality systems by the scientific community. Each of those systems comes with various specifications in regards to hardware and software used. Those in return are influencing the quality of computer graphics and human computer interaction implemented which plays a huge role on the level of presence experienced by participants. Besides those variables, Virtual Reality is indeed a very convenient tool in research as most of those variables can potentially be controlled and modified in comparison to “real” world settings where things are more complicated to customise, at least way more expensive. However, despite the ground breaking works and progress made in those fields, most of those virtual environments contains loads of inconsistencies by design. Those design inconsistencies make it difficult to replicate studies from one lab to another, or even from one study to the next. Comparisons between those studies are difficult due to too many confounding variables. In particular, variables concerning the description of the spatial environment are usually barely described at all. This research will focus on isolating those spatial qualities and evaluating how they affect humans cognitive performances in VR. Next post will present the architectural side of this project and how it will be implemented. Let me know if you have any comment on the writing, the comprehension, and/or the content. Mentioned in an earlier post was the trendy VR location-based experience or, to bring back a better word, VR Arcade. Don’t you miss those arcade video-games locations where we were meeting our friends or making new ones, and playing hard to get our name at the top of the scoreboard? Must be the reading of “Ready Player One” by Ernest Cline that gives me this nostalgia of the 80s. I would love to see that concept brought back to life to experience VR, AR and all the mixed reality coming along. Why is that the way forward? VR systems are still too expensive for the consumers to buy. Furthermore, people don’t have enough room at home to really enjoy the full body natural interaction VR systems afford. Plus, some VR games need specific gears and props that add to the cost. Socially, experiencing VR is an enjoyable event: either just by watching someone playing or by joining a team on a quest. All these issues are being remedied by having a dedicated VR space to hire. French cinema company Mk2 proposes an unbeatable access to curated VR content in their dedicate space in Paris. (mk2VR) They even have a flying simulator to support your body in flying mode. The Void is building four locations worldwide as entertainment park for mixed reality experience. China sees VR also as a huge entertainment destination. They are making their own head-mounted displays to use in their new VR location-based experience known as SoReal Park. On a smaller scale, London has a couple of VR Arcade destinations so far. The dnaVR proudly announces to be the first London based VR experience. Early this year, we also heard about an OtherworldVRA, though, not sure what happened with this one. I know there is a game bar somewhere in Dalston that runs a couple of VR HMD as well. VRchampions, based in Harrow is not too far with their army of HTC vive VR experiences. Vive is actually making developers or entrepreneurs lives as easy as can be by encouraging and supporting the community with the Viveport platform for developers on the one hand and the Viveport Arcade on the other. Now that I am resident at the new Islington Youth Center Soapbox, in Old Street and have a dedicate VR cave, starting a Virtual Reality Arcade sounds very attractive? What a way to create a double layer of new memories by going to a physical place before exploring virtual environments with your friends? The anti-thesis of virtual reality is the actual restriction to only one point of view in only one direction. This is what “perspective” is. And this explains what happened in western culture since his invention: the reduction of our perception of the world to one perspective. 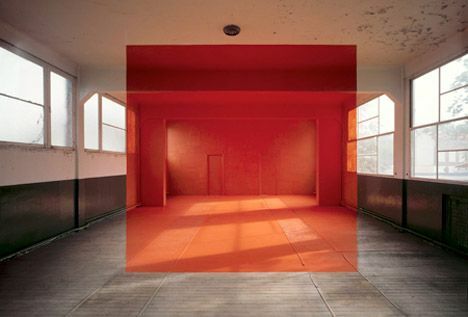 George Rousse captured this phenomenon in his installations with a perfect sense of accuracy. 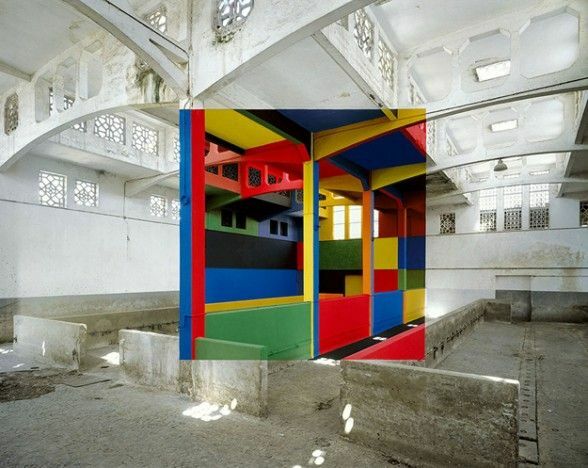 Those surreal photographs can only be taken from one very accurate location to show a perfect geometric shape. One inch on the side and the depth break the geometry. Through the lens of the camera, his primary material is space. He crystallises that architectural space by proposing a static reading through the frame of a photo. I take this as a reaction to the dynamism, and potentially the loss of perspective, that an immersive approach to VR has to offer. The final photographic image perturbs our visual habits and convictions by presenting three kinds of space: the real space, where he makes his installations; an imaginary utopian space, which the artist invents and then carefully builds at his chosen site; and a new space that is visible from only one spot when he clicks the camera shutter, and exists only in the photo.